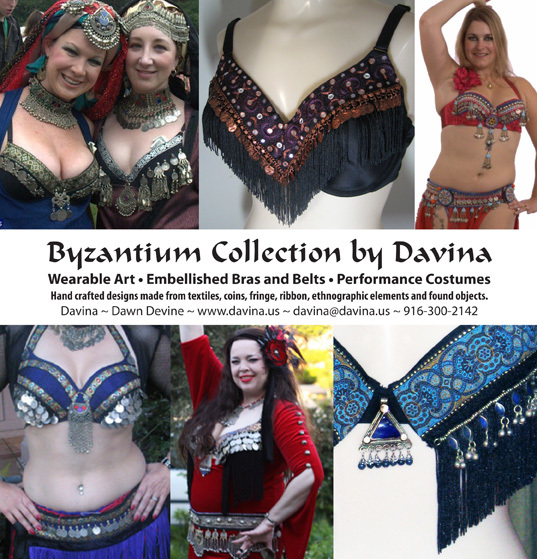 The Byzantium Collection is my line of custom tribal-fusion belly dance performance wear. All of the garments are one-of-a-kind due to the unique nature of tribal coins, materials, ribbons, fabric and trim. I work one-on-one collaborating with individuals to craft items designed and made from materials pulled from their personal collections. Assuite Inspirations – Recently, I’ve been working with a lot of luxurious assuite. I’m photo-documenting this project for future blog posts, so if you share my passion for assuite, be sure to sign up for my mailing list.